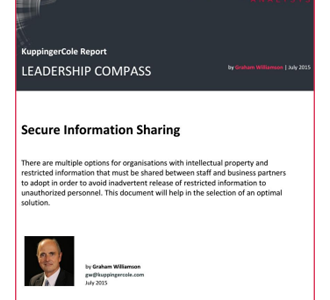 Prot-On, The Only European Company named Product and Innovation Leader by KuppingerCole in its recently released Leadership Compass Report on Secure Information Sharing. Prot-On has also been qualified in the report as “Strong Potential” and “Hidden Gem” in the Market/Product and Market/Innovation analysis categories. 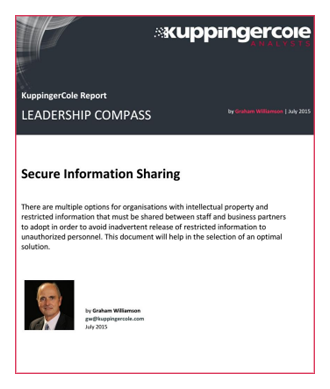 The Leadership Compass Report on Secure Information Sharing document provides advice for selection of Secure Information Sharing technologies, a field that is already perceived as one of the most relevant countermeasures to protect businesses from information theft. “Prot-On is in the Leader section; they offer a cloud-based solution providing complete control over data at rest, in-motion and in-use with a custom-designed key management solution” ”Prot-On demonstrate innovation in their user interface and easy control of document permissions by users”. “Prot-On is honored to be considered a Leader in KuppingerCole’s Leadership Compass for Secure Information Sharing,” said Oscar Maire-Richard, Prot-On CEO. “As a fast growing startup we appreciate the recognition and evaluation of our product quality, innovation and growth potential. We are glad to be ahead of most solutions in this market and be the only European company in that position”. Fundada en 2004, KuppingerCole founded in 2004, is a leading Europe-based analyst company for identity focused information security, both in classical and in cloud environments. KuppingerCole stands for expertise, thought Leadership, and a vendor-neutral view on these information security market segments, covering all relevant aspects like Identity and Access Management (IAM), Governance, Risk Management and Compliance (GRC), IT Risk Management, Authentication and Authorization, Single Sign-On, Federation, User Centric Identity Management, eID cards, Cloud Security and Management, and Virtualization.